Marvin J. Taylor is director of the Fales Library and Special Collections at New York University where he founded the Downtown New York Collection in 1994. Taylor holds a BA in comparative literature and an MLS in librarianship from Indiana University and an MA in English from New York University. He has held positions at the Lilly Library, Indiana University; the Rare Book and Manuscript Library, Columbia University; and the Health Sciences Library, Columbia University. Taylor’s research interests include experimental art, music, performance, and literature; gender politics; archival theory; masculinities; and queer theory. Andrea Geyer is an artist living and working in New York. “The Natural Enemy of the Librarian” was published as part of Triple Canopy’s Research Work project area, which receives support from the Andy Warhol Foundation for the Visual Arts, the Brown Foundation, Inc., of Houston, the Lambent Foundation Fund of Tides Foundation, and the New York City Department of Cultural Affairs in partnership with the City Council. Andrea Geyer, Passing Lines, 2017, series of digital C-prints, each 15" × 10". I have worked in Elmer Holmes Bobst Library and Study Center, New York University’s main research library, on Washington Square Park, for twenty-four years. I have always found the design of the building beautiful—more so than just about any other library building I have been in. Every day I walk through the revolving doors and gaze immediately upward toward the series of cascading bronze stairs, which ascend twelve stories. I stand in the ten-thousand-square-foot chasm, which is encircled with clinical precision by shimmering catwalks. 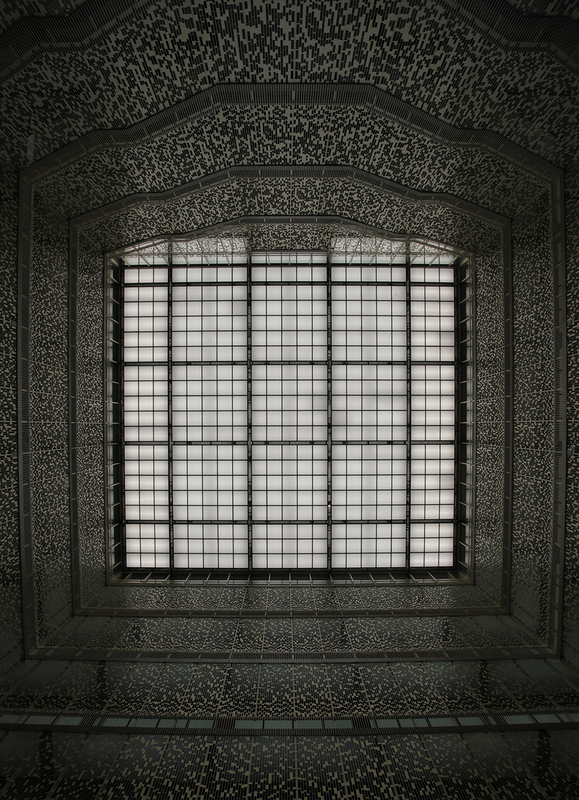 The pattern of black, white, and gray marble on the ground floor resembles an Escher drawing viewed through the lens of the Italian Renaissance. The stark simplicity of the railings and the harsh, clean lines remind me of a Mondrian painting. My chest feels a little lighter and my head swims a bit, as when stepping into a cathedral and being drawn heavenward. Ellsworth’s vitriolic letter set the tone, and librarians continue to vehemently denounce the building to this day. They allege that Johnson, like so many architects, failed to appreciate the purpose of the building or draw on the knowledge of librarians. 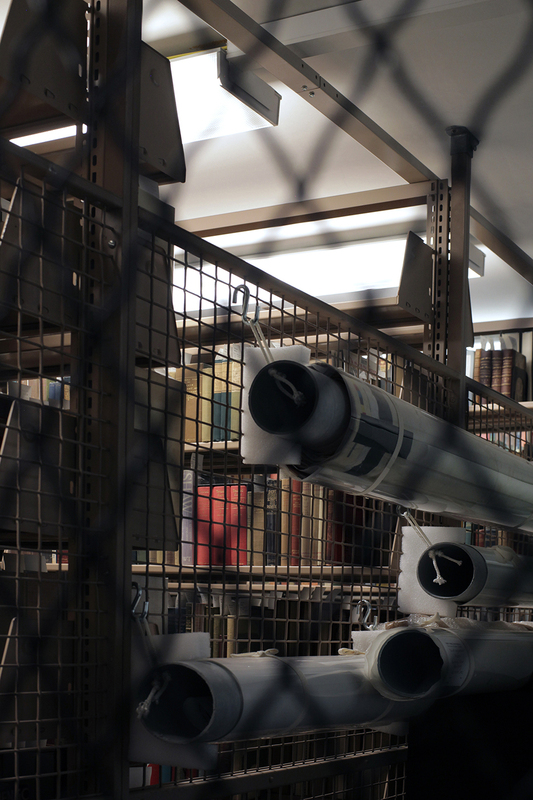 They resent that the needs of researchers, and imperatives of storage and preservation, were deemed to be less important than the desire for grandeur and monumentality. And, unknowingly, they express an abiding tension between practical design and aesthetics, between librarians and architects, which has a curious history. To make sense of the persistence of this narrative, I dug into the history of American academic library design and the discourse between architects and librarians. I sought to understand the epistemological implications of Johnson’s design of the library—which also is a social hub. Was Johnson moving away from modernist notions of architecture and the arrangement of books and documents? Was he inaugurating an organization of space that was centered on dynamic relations between people in space, rather than on monolithic systems of communication? Does Johnson’s focus on the interaction of people to create knowledge, instead of to preserve and protect culture, signify a shift toward the postmodern? What is the genealogy of the librarian-architect dynamic? The idea that a library like Bobst might reflect a shift in the expression of knowledge was presented to me by David Kaser, who taught a class on the history of library architecture when I was a student at the school of library and information science at Indiana University in the mid-1980s. Kaser was the kind of scholar and librarian that was quickly disappearing. In addition to teaching courses on the history of printing in the United States, he researched library architecture and the status of libraries in the academy in the nineteenth and twentieth centuries. To those more interested in “informatics,” Kaser was an anachronism, but I found him fascinating for his knowledge of libraries across the country. He never looked beyond the administrative implications of building designs, but he opened my eyes to the possibility that libraries reflect the history of how we express knowledge. In The Evolution of the American Academic Library Building (1997), Kaser argues that libraries should be designed to preserve materials, facilitate functionality, and attain beauty, but he admits that “very few have done all three.” As Kaser explains, there were no academic libraries in the United States until the mid-nineteenth century. Early American colleges tended to be small and religious, so at Yale and Brown, for example, the library shared space with the chapel. (Round libraries, such as the one designed by Thomas Jefferson for the University of Virginia in 1826, were also common.) In 1840, the University of South Carolina erected the first freestanding library, a classical edifice with four imposing columns at the facade. The next were built, in the Gothic style, by Harvard in 1841 and Yale in 1846. Harvard’s library was modeled after Kings College Chapel, built in Cambridge in 1446, and Yale’s on Trinity College, built in Dublin in 1732; both chapel-like structures exemplify the influence of ecclesiastical architecture on library design. While the earliest continental libraries were rectangular with perimeter shelving, the Classical and Gothic revival libraries in the United States featured an “alcoved hall with double-faced book presses extending inward between the windows in the two longer halls,” writes Kaser. Some libraries added clerestories with galleries that allowed for more shelving and also gave the impression of cathedrals. The only purpose of these early American libraries was to store books. Many used a classification system that was simply enumerative. Rather than books being grouped by subject, the handwritten catalogue often listed books seriatim, which was acceptable because the number of volumes was so minuscule. Eventually, alcoves were created to increase the amount of space available for shelving, which led to the adoption of general subject classifications. Why library architecture should have been yoked to ecclesiastical architecture, and the two have been made to walk down the ages pari passu, is not obvious, unless it be that librarians in the past needed this stimulus to their religious emotions. The present state of piety in the profession renders the union no longer necessary, and it is time that a bill was filed for divorce. The same secular common-sense and the same adaptation of means to ends, which have built the modern grain-elevator and reaper are needed for the reform of library construction. Poole’s writing expresses a particularly American practicality, which also characterizes the work of his colleague Charles Ammi Cutter, who for twenty-five years helmed the Boston Athenæum’s library. Cutter fostered interlibrary loan programs, advocated for the provision of proper lighting and control of humidity, and invented his own classification system, which influenced the Library of Congress and is used throughout the world. Despite the remarkable achievements of librarians like Poole and Cutter, their focus on functionality and pragmatism has hindered serious theoretical writing about librarianship and archival practice in the United States. How different might the situation be if they had been attentive to the ways in which social relations and cultural values might be communicated, even engineered, through the design of buildings that are not merely machines for the storage and circulation of books? Of course, the ire of Poole and his colleagues was not just a response to the impracticality of architects. At the same conference, the architect J. L. Smithmeyer, who was designing the Library of Congress, fanned the flames by proposing exactly what Poole detested: a grand building in the ecclesiastical style that didn’t incorporate any of the ideas of librarians.2 Poole was livid; even the plans for the national library were being developed without input from librarians. But Poole wasn’t about to give up. After Smithmeyer’s presentation, he proposed that the ALA pass a resolution in support of “a radical modification to the prevailing typical style of library building, and the adoption of a style of construction better suited to economy and practical utility.” The resolution passed. Some architects responded to the criticisms and tried to ameliorate the situation. In 1888, the librarian William Isaac Fletcher published a letter in American Architect that acknowledged his colleagues were “perhaps a trifle long-haired,” appealed for dialogue, and calmly explained his profession’s central principles. Invited to speak before the ALA that year, the architect Normand Patton admitted: “It would be a singular mistake to plan a church and forget the convenience of the minister; and yet many a library has been planned, and apparently the librarian has been left out of the calculation.” A détente ensued and librarians began working with architects, if somewhat grudgingly. Between 1875 and 1890, as Kaser notes, university instruction began to shift. American universities came to favor seminars, which required students—especially graduate students—to refer to many primary and secondary sources. This resulted in a staggering increase in the collections of libraries, which required a new design approach. Architects began to use core stacks made of iron and, often, glass, which allowed for the flow of light. This model, taken from German universities, won the approval of Poole and his compatriots. “Enter the Behemoths,” as Kaser calls the new libraries. The first iron book stacks were built in 1877 as an addition to Harvard’s Gore Hall. Partitions established separate spaces for books, seminar rooms, technical services, periodicals, and reference. Because of the size of the collections and the ways in which they were being used, new systems were required for organizing and locating books. The William Rainey Harper Memorial Library at the University of Chicago, completed in 1912, was the first to distribute the collections by subject and provide adjacent seminar rooms for students. Harper Library pointed to a new understanding of the shape of knowledge, as reflected by systems like Dewey Decimal Classification and Library of Congress Classification. In determining the subject of each volume, librarians also expressed the epistemes of their time. This was the model for Butler Library at Columbia University, which opened in 1934. Following the Chicago model, the massive new structure was designed around a core stack with radiating reading rooms, organized by subject. The behemoths were incarnations of Poole’s grain elevator; they were storehouses for especially valuable commodities. At Butler, a prominent mural by the American artist Eugene Savage depicts Athena as defending knowledge—the cultural record of the upper classes—and the Columbia campus from the ignorant, who are portrayed as buff, dark, green-skinned monsters. Columbia, after all, retreated uptown to escape the squalor of the city and to build the “Acropolis of New York.” Occasionally, an undergraduate recognizes the meaning of the painting and complains, but most fail to see the implications of the allegory. In his design of Bobst Library, Johnson was looking back to the magnificent edifices of the nineteenth century and the grandeur of ecclesiastical architecture. He believed that architects had gone too far in the direction of the utilitarian warehouse and neglected those who would inhabit the building. He wanted a building that could serve as the core of the university, a gathering place where people could “see each other working,” as Mervin Dilts, a professor emeritus of classics at NYU, told me. I’m not at all ashamed to use the word, monumentality, glory, pride, but nonetheless you have those feelings whether one admits them or not. It’s only permitted now in churches and military establishments, but there is no reason why universities should not and could not have a central pride. They certainly did in the nineteenth century. Hester had opponents not only at NYU but in Greenwich Village, where residents saw the building as a town/gown issue. Four people—including the author and activist Jane Jacobs and the congressman (and, later, mayor) Edward Koch—tried to hinder the construction by suing the city to prevent the necessary variances from being issued. In the end, the case was thrown out. Hester, who had stated that the library would be his most important legacy, and Johnson rallied their allies and persuaded Mayor John Lindsay to grant approval. However, the troubles did not end. Construction was plagued by setbacks, incompetent construction agencies, the bankruptcy of the quarry that was supplying the red sandstone that Johnson chose for the exterior, and labor strikes. Bobst finally opened on September 12, 1973, nearly ten years after being designed. 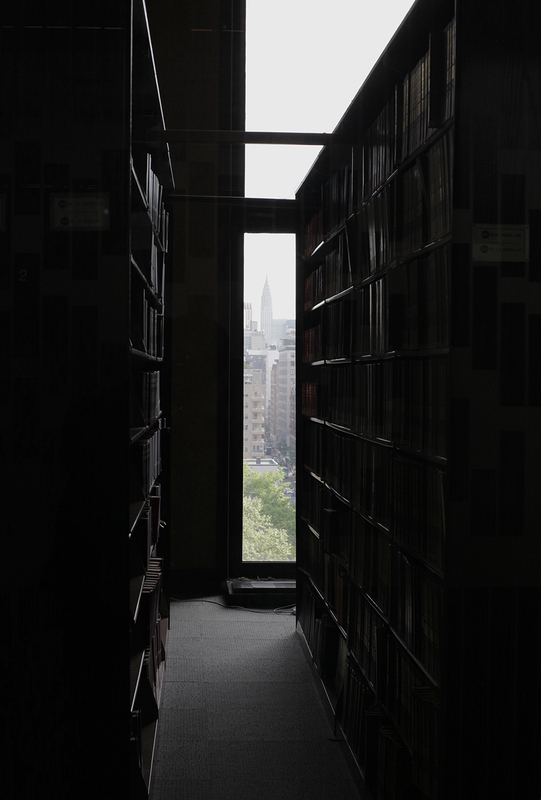 Even as Bobst has become the center of the campus life, NYU has outgrown the library, which more than ten thousand people pass through each day. 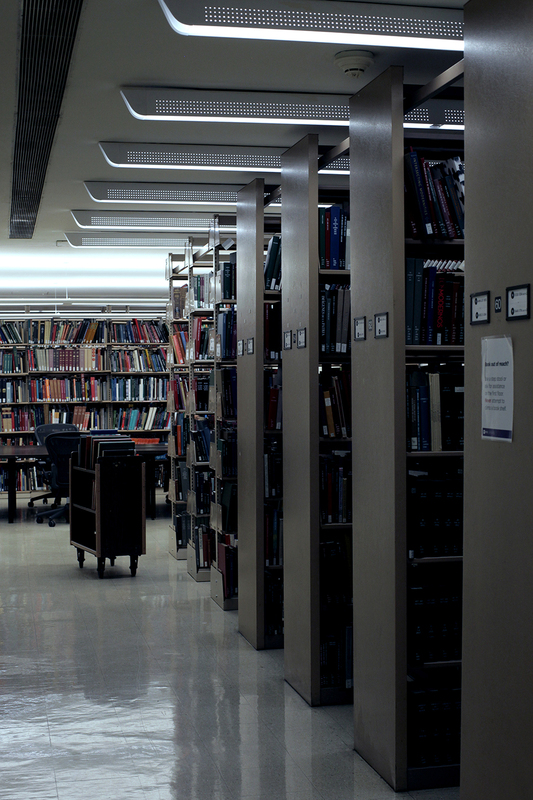 No library remains sufficiently spacious after thirty years, and Johnson’s design predates the personal computer; the digital age has turned the library into an entirely different beast. That said, Johnson enabled patrons to see one another and be integrated into the shelving; to engage in the creation of knowledge and not just access a warehouse. Rather than fix subjects in place, the library encourages them—and not just books—to circulate and relate to one another. As critics are quick to point out, Bobst, like so many contemporary libraries, is a space for social interaction, not just quiet contemplation. That, however, is now the nature of research, teaching, and knowledge. Yet, to some, the building feels like a panopticon, with each visitor aware of the possibility of being watched at all times, if not by centralized guards then by other library users. This new criticism of the atrium, though cast in postmodern—and, specifically, Foucauldian—rhetoric, perfectly fits within the long-standing librarian-architect dynamic. Without quite knowing it, Johnson seems to have moved from the modern to the postmodern and marked an epistemological shift—which is apparent in our treatment of knowledge as well as our design of libraries. In recent renovations, the university has added classrooms, collaborative study spaces, and research commons, which have made the building more and more “user-friendly.” Johnson foreshadowed these changes in his desire to make the library a place of activity and not a warehouse for knowledge. 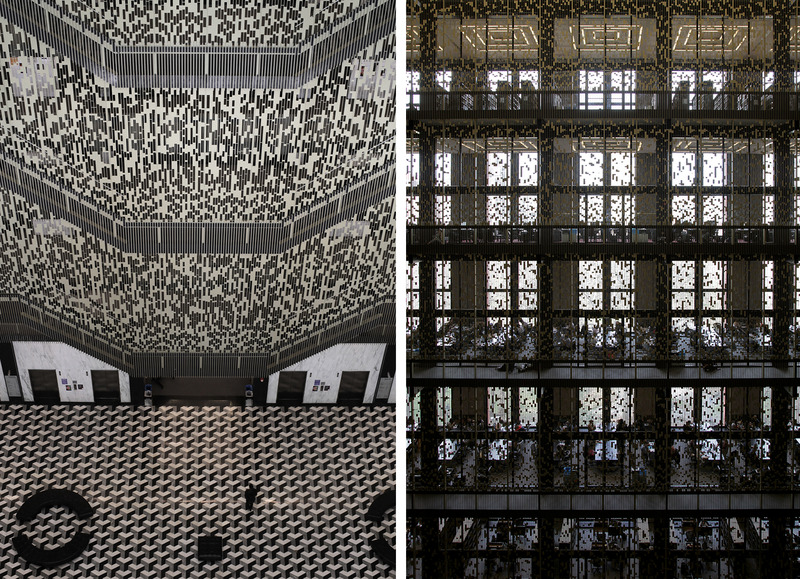 Of course, other changes to Bobst have coincided with an effort to combat suicides after students flung themselves from the upper floors to the atrium in 2003 and 2009. These deaths pulled the building back into the modernist camp. Johnson’s genius design of the atrium allowed for the ease of the suicides. His vision overshadowed the needs of humans living with the building. Fortunately, the architectural intervention to prevent suicides maintains the grandeur and even amplifies the symbolism of Johnson’s original design. Architects hired by the university enhanced renderings that Johnson made for panels to be installed at the New York State Theater, creating thirty different designs. These were turned into massive bronze cutouts and installed in the atrium to prevent anyone from jumping. Today, looking upward from the lobby at the atrium, you not only have the feeling of awe but the impression of glittering waterfalls of digital data flowing from the top floor. 1 Poole later published his speech as an article, “The Construction of Library Buildings,” in the April 1881 issue of Library Journal. 2 Smithmeyer’s presentation was published in the same issue of Library Journal as Poole’s.